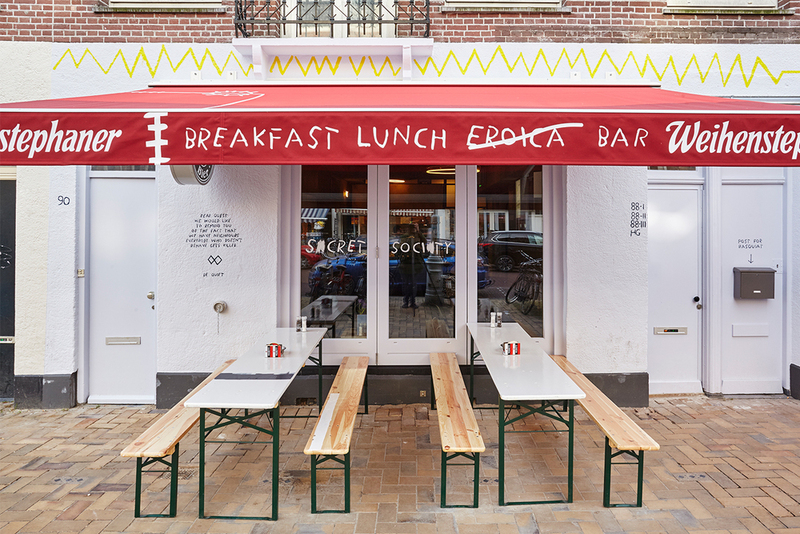 Studio Modijefsky has recently completed a new bar in Amsterdam East called Bar Basquiat. Named after one of the most celebrated American artists of the 20th century, poet and painter, Jean-Michel Basquiat, the bar is located in a multicultural neighbourhood packed with small shops and markets. Formerly a local supermarket with a butcher inside, the building had plenty to offer; large openings facing the main street and a strong grid of beams on the ceiling. 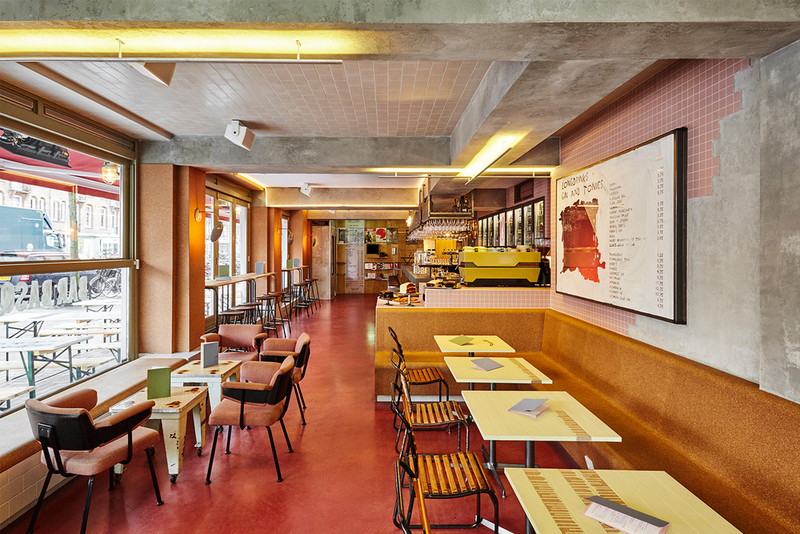 The urban characteristics of the area together with Basquiat's artistic ideas and visions; and the distinct quality, which the space offers create the foundations for the concept design of the new bar. Basquiat's paintings are known for their superposition of color-text-sketch, his work contains notes extracted from books and lyrics, which in most cases are directly connected with his urban life, experiences and feelings. Reflected in the interior, façade design and graphic design of the bar, material overlay and collages show an interpretation of the artist’s work. A dominant grid of beams covers the entire ceiling, creating a strong foundation for space planning. Being a former supermarket the space offers a clear zoning for product placement, which overlaps with the beam structure. Custom made lamps highlight the grid; some placed on the beams themselves and some outlining the corners. A combination of TL lights and neon lights brighten up the space and bring it to life. The grid also creates an excellent hanging point for the glass rack above the bar, covered in the same metal mesh that covers the drink displays it complements the concrete bar underneath. The use of space in the supermarket, combined with Basquiat’s tradition of mixing and overlapping materials is used as an inspiration to create different zones with different materials in the new interior. Cork furniture placed in the window sills refers to the nut and dried fruits section of the shop and continues into the coffee corner where a large fridge used to stand, now this area is covered in tiles with a ‘KEEP FROZEN’ sign from Basquiat’s quotes hanging on the wall. Milky textured paint covers the wall of the dairy products section in the shop and a huge menu in the form of a receipt hangs in the former position of the cash register. 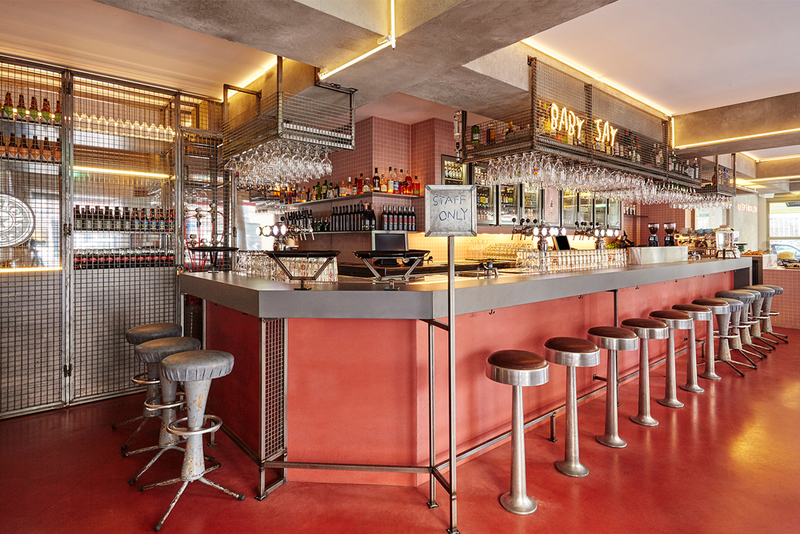 Central to the past layout of the supermarket, the butcher gives its bright red colour to the concrete bar, which expands throughout the interior. Tailor made steel plates cover the walls, replacing shelves stacked with canned products. Bottled drinks are displayed in a shelf covered with a metal mesh, which re-imagine the shopping basket. New custom doors reminisce old fridge doors and connect the interior spaces as well as marking the entrances. Custom made furniture pieces compliment the design along with specially selected timeless chairs and tables. 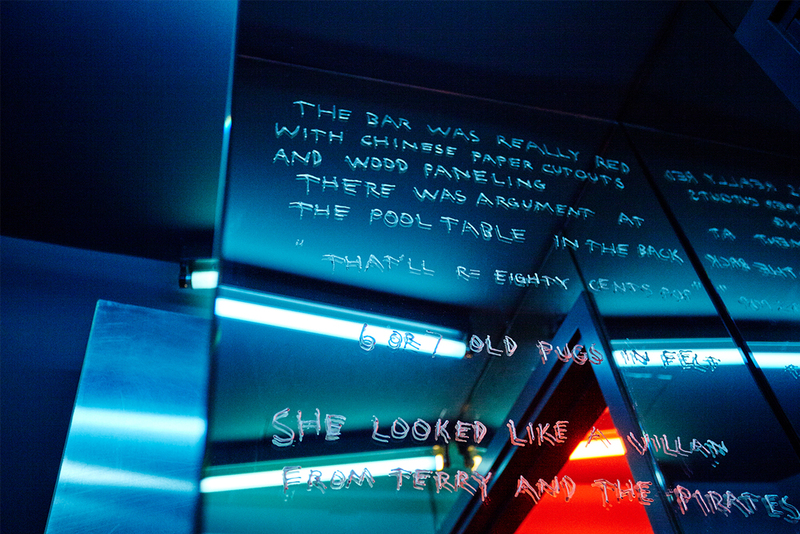 Graphics play a strong role in the bar. Designed based on a thorough investigation into Basquiat’s life and art, a graphic layer first appears on the façade and sunscreens, tweaking the curiosity of the passerby. Inside, layers of raw materials and volumes overlap and create one big collage. The graphics appear on walls and continue onto the furniture, integrated into the interior in different ways using a variety of materials and finishes. 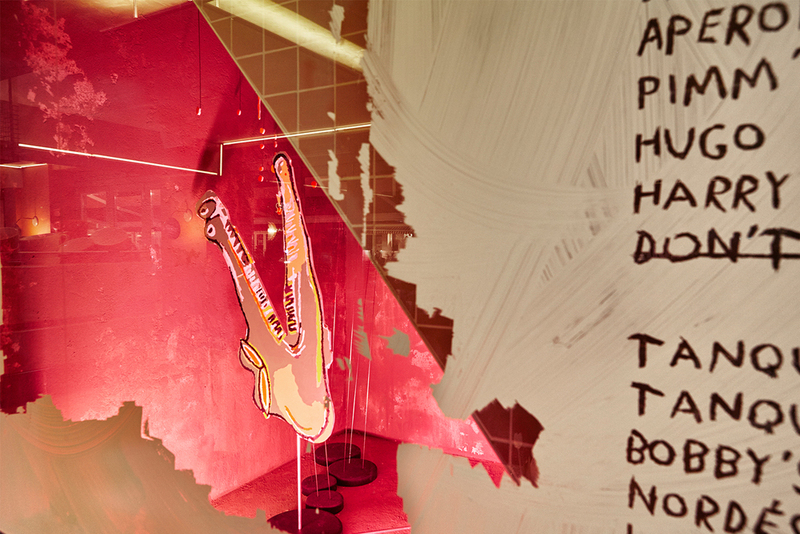 Hobo signs, also used by Basquiat, inspire signage throughout the interior and are used widely in the menu design. The logo design along with the font compliment the graphic identity of the bar. With a daring and original concept, BAR BASQUIAT is a distinctive new bar designed to be as rebellious as Basquiat himself.